Recruiting has started for the 2019 Art, History, and Global Citizenship Paris May Term at Hope College! (Apply here by Nov. 12). As we prepare for May of 2019, we reflect back on several highlights from this past May. The 2018 edition of the Paris May Term was a big success. We loved engaging a new group of students with the city of Paris in all of its beauty but also all of its history and complexity. We left before the World Cup, but at least we were in Paris for a bit of this amazing summer of Les Bleus! One new addition to the 2018 May Term program was a final project by our history and art history students. Their final projects required that they create Smarthistory-style videos analyzing a piece of artwork or historic site. We are sharing a couple of these videos here. (Check out Smarthistory and their awesome videos here.) These engaging student videos are excellent examples of the critical thinking needed to bring history and art history together in a compelling analysis, and they provide interesting glimpses into two remarkable Parisian museums. Cherish Joe (Studio Art, ‘20) and Maddie Zimmerman (Art History/Chinese, ‘20) take us into the Musée Quai Branly and discuss not only King Ghezo’s Throne but also Benin art in general and the impact of the transatlantic slave trade on the Kingdom of Benin and its artistic production. They also offer a critique of the Musée Quai Branly itself. Kelly Ocock (Studio Art, ‘19) and Merrit Kramer (Business, 2021) analyze Marc Chagall’s “Derrière le village,” 1916, as they observed it in the “Chagall, Lissitzky, Malévitch: The Russian Avant-Garde in Vitebsk (1918-1922)” exhibition at the Centre Pompidou. They analyze this piece in the context of other art from the period and in the historical context of World War I. We look forward to May 2019 – come join us! Parisian culture frowns upon skipping lunch, to-go cups of coffee, and blinding ambition. I’ve learned what it means to taste, see, and experience life in Paris on a richer level than I ever have before. Whether my evenings were filled with reading and writing on the Seine with a macaron or wandering through the Palais Galliera fashion museum, I carried a sense of contentment with me everywhere I went in Paris. The city’s optimism and savory attitude blended into my work at the American Library in Paris. Every morning, we were greeted with a smile by the ALP team. They shared their stories about Paris life with us over lunch in the staff room and during breaks over the work day. In the ALP’s archives, I spent my time sifting through letters, meeting minutes, and photographs from as early as the 1920’s. History was living in my hands, and I felt purpose doing this work. Sarah and I decided to write an archival finding aid for Parisian composer and teacher Nadia Boulanger’s books from the ALP’s Special Collections, which are made up of books once owned by historical figures in Paris and America that no longer circulate publicly. The work we did on Boulanger’s collection was interesting and detail-oriented. We transcribed letters from Boulanger’s friends written in the front of her books and went through each book page-by-page to check for annotations. We felt like we contributed in a small way to the library’s collection and for the preservation of its history. Paris fills my spirit to the brim. Although the trip has not been “une promenade dans le parc” (a walk in the park) — a couple trips to the doctor were a part of these weeks — I didn’t want to be anywhere else. I’ll miss my daily routine of waking up early, taking the metro, and walking through the gardens below the Eiffel Tower to get to work. Though I’m sad to leave Paris, I’m parting this city with a refreshed view of life—all thanks to my time at the American Library and Paris’ infectious, artistic charm. Returning to the French capital this May was exciting for several reasons— it reminded me of the memories I made and the lessons I learned on my last visit here in 2016, during the Paris May term, but also gave me the chance to see this city in new ways. Since it also comes at the end of a semester spent abroad in Nantes, France, this time in Paris was a way to celebrate what I’ve learned about French language, history, and culture while discovering more about what it means to do archive work. The French take moments in their day to socialize around a cup of coffee and spend time in nature, yet they still get their work done. By embracing a bit of this way of life during my studies, I’m appreciating how living abroad (even for a short amount of time) can be an opportunity for growth that won’t end upon my arrival back home. These two weeks archiving at the American Library have been full of new lessons as well. Archive work, like any task, comes with its own challenges. Michaela and I chose to concentrate on the library’s collection of books owned by Nadia Boulanger. In the process of searching these books together, I discovered first hand just how labor-intensive it can be to transcribe unknown documents for the first time or dig through archive boxes for a specific letter. I’m now even more convinced that research is a team effort. Whether a project is a solo endeavor or a communal one, the mental focus and devotion it takes to start, follow, and achieve a project is not possible without support. I loved working with Michaela and Professor Dykstra because their skills, talents, and knowledge supplemented and augmented my own. As an added benefit, the assistance and encouragement that we received from the staff at the library has been integral to our success. One of the best aspects of studying history is its ability to help people travel beyond their own lives and learn about another era, culture, place, or person on a deeper, more personal level. When you devote time and energy to discovering one person, as we did with Nadia Boulanger at the Library, you can dive into his/her story and share it with a larger audience. History is more than a collection of objective facts based on dates— it is storytelling. I hope that the work we’ve done these past two weeks at the ALP helps to continue to tell both Boulanger’s story and the library’s own story. I am incredibly proud of the work that Michaela and Sarah accomplished during our two weeks at the library. They have showed diligence, curiosity, skill and a professionalism that has impressed both me and the library staff. Many thanks to Abigail Altman, Assistant Director of Collections and Reference, for working with us and making this opportunity for possible, and we are very grateful for the warm and generous welcome from everyone at the library. What a memorable first summer and a strong start of a on-going collaboration between the library and Hope faculty/students! I have been thinking and writing a lot about Paris – the city, its history, its streets, its writers and artists, and what it feels like to be here. I arrived in the city yesterday to meet with my research students Sarah Lundy and Michaela Stock for our archival project at the American Library in Paris, an institution with a storied history, started by the American Library Association after WWI with English-language books that had been sent over for American soldiers. We’ll also be joining my Paris Stories colleagues, Lauren Janes and Heidi Kraus, directors of the Paris May Term, and their students. Paris, as the quintessential French city, always seems like the perfect blend of new and old in one place, ideal for anyone who loves history, as I do. I most look forward to the opportunity to explore the American Library in Paris (ALP), which appears to have many materials archived but unstudied, and, through working there, contribute in a small way to preserving the history/culture of such a city. Since it seems that we’ll be assisting the Library with some of the organization and cataloging of their special collections and photos, I cannot wait to see and study some of the Library’s more unique materials, the ones that clearly have a story to tell about how they ended up at the ALP. I also love the idea of building a website to describe these collections, as a way to transport others to Paris and introduce them to the resources there. Paris is, in my opinion, a synonym for perfection. The ivy-covered balconies and stylish French fashion that weaves through the city embodies every childhood dream I’ve had, and I’m so excited to be back in my home-away-from-home to work at the American Library in Paris. As an art history minor, preserving history is an invigorating and important task to me. Though history is anything but an easy path, I’m honored and excited to tackle whatever challenges in these next weeks. I look forward to hearing, seeing, reading, and experiencing the stories of those who came before me. I can’t wait to see what these next weeks have in store! We thank Grand Challenges |Paris Stories, funded by the Mellon Foundation, and Hope College for their strong support of faculty/student collaborations. We’ll keep you posted on our adventures and what we discover. The first day at the library: Michaela and Sarah hard at work making notes about the book collection owned by the French composer Nadia Boulanger and donated to the library after her death in 1979. Jo Di Bona’s 2015 reinterpretation of Delacroix’s “Liberty Leading the People” on the Rue d’Alibert, Paris. Photo by Heidi Kraus. 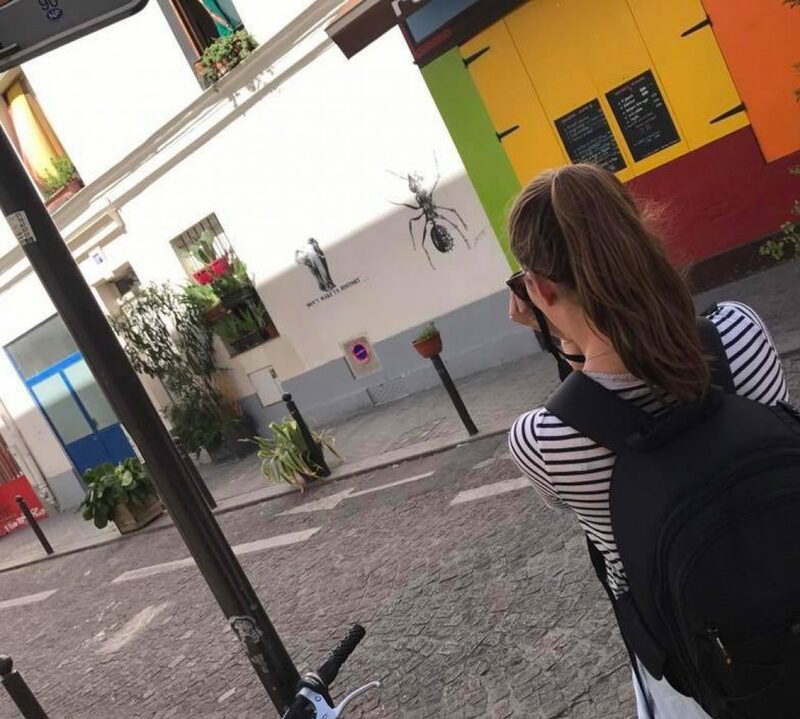 Julia Hines, senior art history/psychology double-major, had the opportunity to work with Dr. Heidi Kraus on locating, photographing and digital mapping street art and public spaces following the 2015 terrorist attacks in Paris. This week, Julia is presenting her field work at the National Celebration for Undergraduate Research at the University of Central Oklahoma. READ MORE about her story and Dr. Kraus’s research here.